We all have a huge collection of clothes that can be segregated into various categories depending on the season, festivals, and events and so on. However, at times we fall short of the apt clothes for certain occasions, especially for a laid back coffee evening. So, we are trying to give you a few options here to get an idea or inspiration to find the best set of clothes for such occasions. 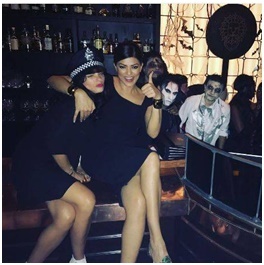 Jacqueline is a fashion diva who gives us fashion goals whenever steps out. Even in a simple laid back event dress here, she is looking just amazing as usual. The warm and happy blue color sleeveless dress is simply flawless. Barely noticeable neckpiece and shades are complementing the dress perfectly with a pair of white and black color heels to increase the cool quotient. Try this sundress lookalike outfit for your evening outfits in stores near you or find it here. Lavender is one such color which looks gentle and beautiful all the time. 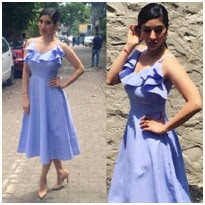 The ruffled frills design around the neckline of this sundress is giving a grand look to the otherwise simple looking outfit. She chose to not combine any accessories with the dress instead wore a pair of cream color pointed toe stiletto pumps for the perfect look. You could also get this fabulous look by clicking here. Gauhar Khan keeps surprising us with her choice of outfits and style. She is looking gorgeous here in this black and white LBD. The sleeveless black dress is embellished with white embroidery works which resemble the design pattern of snowflakes. She chose to highlight the grandeur of her dress by avoiding all accessories. The best thing about her look here is the T-Bar black color sandals. If you wish to try this Gauhar style for your evening gala, then check here. 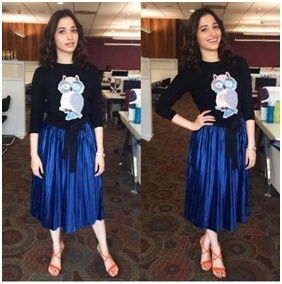 Tamannah is a true fashionista who has a perfect sense of fashion. She is showing you a funky style to color up your late evening parties. The shock blue color pleated skirt and black top embellished in owl patchwork with a choice of Orange color high heel sandals make it a ‘fun to go’ party outfit. Try this look here. Style tip: Accessorize with golden to add bling and glamour. 6. When you’ve got a party after work! For more options for your evening party wears, check this page.